Re-engage with the knowledge of the Old Ways! Each stunning card speaks of methods, spells, and magic that connect you with the elements, mystical realms, and spirit to bring about a powerful sense of positivity and change in your life. Venture down this magical avenue and draw upon ancient wisdom that is still alive today. 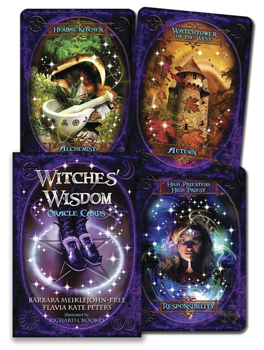 This Witches' Wisdom Oracle Cards kit includes 48 silver-gilded oracle cards encapsulating the wisdom of the Wise: healers, teachers, herbalists, and gifted oracles who are the custodians of the magical potency of the Craft. Also includes a guidebook with sample spreads, easy to remember and repeat invocations, information about the cards, and much more.